Visit Turtle bay if you’re looking for Caribbean eating & drinking… cool cooking with hot flavours! 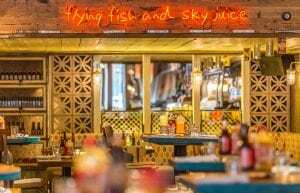 Turtle Bay have 2 fantastic restaurants in Manchester, both about 10 minutes’ walk from Picadilly Station. The contact details below are for their Northern Quarter location. Advanced reservations are advised for both at weekends. Catch one of the frequent trains from Manchester Airport to Piccadilly, we’ll drop you at the airport station and pick you up again anytime in our complimentary 24-hour shuttle bus.